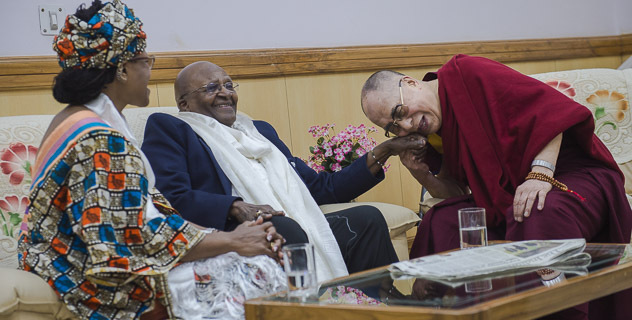 (TibetanReview.net, Apr20, 2015) – Tibet’s exiled spiritual leader, the Dalai Lama, on Apr 18 personally welcomed South Africa’s retired Archbishop Desmond Tutu at the Kangra Airport. The two Nobel Peace laureates and ‘spiritual brothers’ are to publish a series of dialogues on finding ‘real inner joyfulness’ under the title of ‘Book of Joy’. Addressing the press at the airport, the Dalai Lama praised Tutu as a ‘genuine good human being’ while expressing happiness over the visit. As well as marking the Dalai Lama’s 80th birthday at Dharamshala, the two will spend time “in deep dialogue and playful laughter as they share their experience of how to find joy in the face of life’s challenges”, The Guardian Apr 15 quoted publisher Hutchinson as saying. Their discussion will form the basis of the text, with the pair also inviting members of the public to ask the questions about joy and happiness they most want answered on the authors’ Facebook pages, the report added. Subtitled “finding enduring happiness in an uncertain world”, the book, Hutchinson has said, is “a unique collaboration that reflects the extraordinary friendship of the authors”. It will be co-written by Doug Abrams, who has worked with Tutu on previous books, and who will conduct the interviews. Tutu is spending seven days at Dharamshala, said the exile Tibetan administration at Dharamshala on its Tibet.net website Apr 19.